Did you ever send postcards back home to friends and family on your travels? I think most of us have. I used to love to look through the postcard racks when I was a kid. View cards have, since postcards began, been the mainstay of the collecting field. People have long collected and traded cards of their home towns and places they have visited. View cards offer historic reference to buildings, streets, and even towns which may no longer exist or that have changed significantly over time. Even views produced in the photochrome (chrome) era may no longer look the same. The earliest cards offer much in the social history of the times as we look at early forms of travel and the beginnings of telegraph, telephone and power lines. The messages written on the cards often give us insight as to the picture shown or the sentiments of the day. The formal name for postcard collecting is deltiology. Deltiology is the third largest collectible hobby in the world. 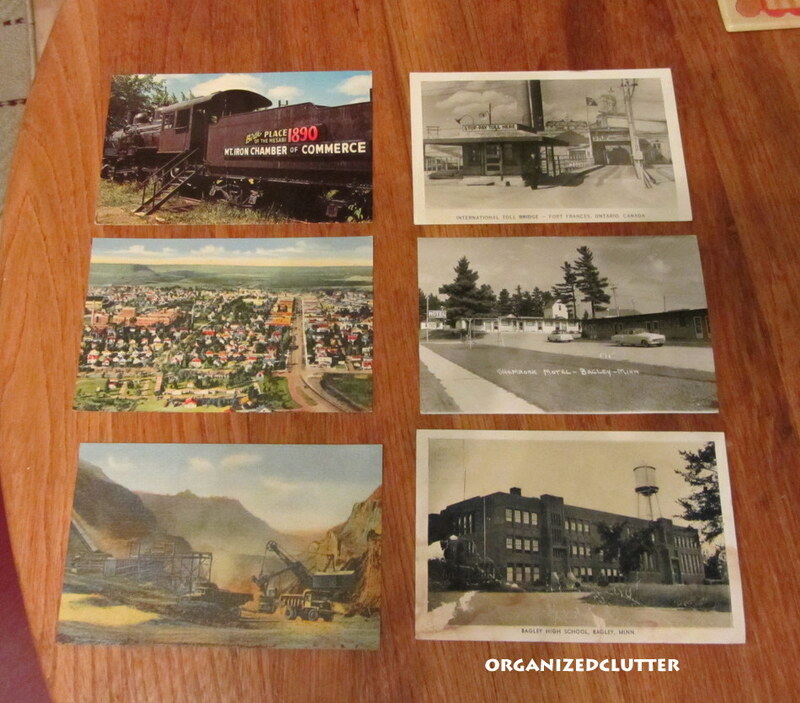 I am not a deltiologist but I do have quite a few old postcards. Today I am sharing just six. 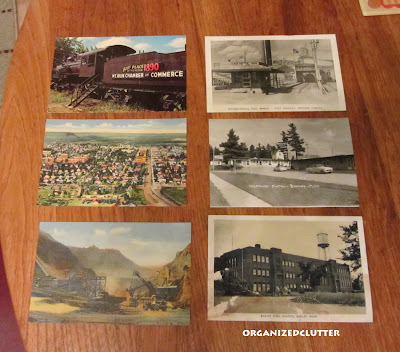 The first one is a linen type postcard of Weggum Mine in Hibbing, Minnesota. Euclid 15-ton trucks loading and dumping iron ore onto conveyor screening plant. Geniune Curteich-Chicago "CT Art-Colortone. Also Hibbing, Minnesota. Looking west with Village Hall and Howard Street in center and High School and Memorial Building at left. This is also a linen type postcard from the same maker. This postcard of Mountain Iron, Minnesota, calls Mt. Iron the birthplace of the Mesabi Range. "Tour Taconite plants, fish, hunt and relax in Mt. Iron". This is a Plastichrome postcard by Colourpicture Publishers, Inc. This is a black and white photo postcard of the toll bridge connecting Fort Frances, Ontario, and International Falls, Minnesota. My parents attended this high school in Bagley, Minnesota. This black and white postcard was an Eagle Post Card View, Co. card. Also from Bagley, Minnesota, the Shamrock Motel. Look at the cars in the photo and you know it's an old postcard. The card is by A Pearson Co, Inc.
Old view cards helped us remember our travels. Carlene, You have some great postcards in your collection. I have a few old ones but most are from our travels that I collect. I look for a few to keep when we travel. Thanks for sharing. I love old postcards too! My son recently found a couple from the 1960's that were from Biloxi, MS. I didn't even recognize the buildings! Thanks for the recent visit! I love old postcards. Ones from a hometown are fun to see. I love reading the backs too, just found and scanned a bunch from when my Great Grandparents went to Niagra Falls in 1911! How fun! I tried to find our house in the postcard (it was one of the first on our street) but I think the artist made a few changes and added the slashes of red coloring. I do recognize many of the buildings on Howard Street, but many have been demolished, too. I love the motel shots and the view of the town that was once so homey. The motels remind me of our summer vacations when I was a kid. We always got postcards of hotels we stayed at. Wish I still had them. I remember many of the places because i remember the postcards. Great memories, as always! I love old postcards! Thanks for joining me at HSH!